Hello and thanks again for tuning in. Once again, our aim with this newsletter is to update you monthly on all things relevant impacting this new space, as well as some technical analysis. Facebook has decided to join the blockchain party! Checkout what David Marcus, former head of Facebook's messenger department had to say. Switzerland's main stock exchange (SIX) has announced it will open a fully regulated cryptocurrency exchange in 2019. IBM signs Multi-Million dollar deal with Australia to use blockchain for data security. Winklevoss' Gemini Exchange Recruits NYSE (New York Stock Exchange) Chief Information Officer. Robert Cornish has joined Gemini as its first Chief Technology Officer. $5.6 MILLION Andy Warhol piece to be sold for partial ownership via blockchain. With more than 1500 coins, tokens, etc.,and more hitting the market every month, it's hard to determine which will emerge as the leader(s) in the space. Given the above; diversifying your crypto portfolio makes a ton of sense. As I build my crypto portfolio; monies will be concentrated to my list of top 10s or top 20s. Coinbase is creating an index fund. As of current; the Index fund is only comprised of the four largest cryptocurrencies (Bitcoin, Ethereum, Bitcoin Cash and Litecoin). Expect the fund to go live in a few months. If you want to invest; feel free to sign up here. "Since our last Newsletter, I've made zero purchases. I continue to HODL and await better entries. -Quote from (May/2018) Newsletter. First image or image on your left; was issued in our June/2018 Newsletter. In that Newsletter, we indicated that a bearish inverted 'cup and handle' pattern was forming. We called for more downside with Bitcoin and more downside happened! The test for Bitcoin, if the bulls are to really take control, is for it to hold those $6500 levels. Neutral on the coins this month. I anticipate minimal movement. Minimal movement bodes well for the currency in the longer term. 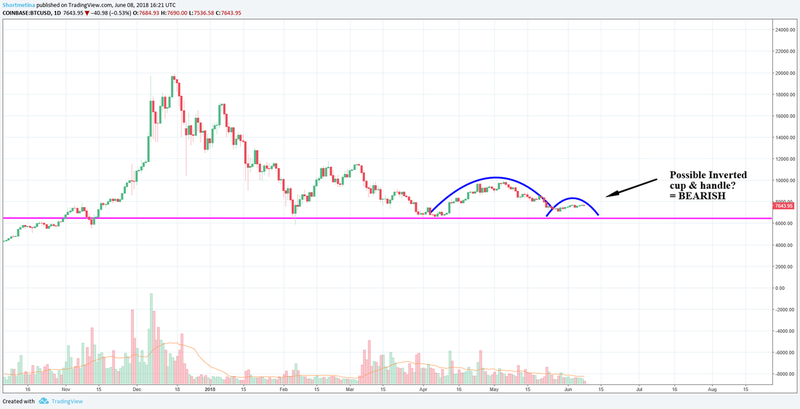 Similar to Bitcoin; because of the inverted 'cup and handle' pattern that formed last month (refer to June image); we called for more downside in our June Newsletter. Similar to Bitcoin, Ethereum has rebounded slightly and is up over $80 dollars from its $404 June lows. Litecoin, similar to the other coins, continue to put in 'lower highs'. This is partially what happens when a 'coin' or 'stock' is in a downtrend. Litecoin is sitting in the low $100s and while I see a dip lower; I think we are hovering around an area most folks are comfortable with. 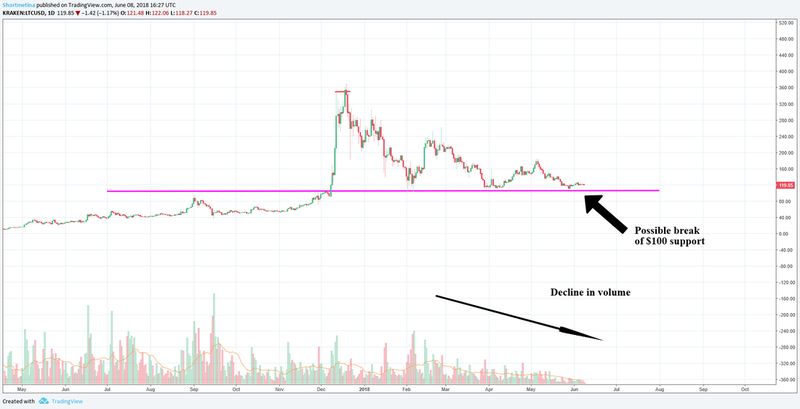 A break below $100, however, can cause massive selling. Continue to pay attention if you're a holder of Litecoin. A dip below $100 did not create a mass exodus but we did have a significant pullback. 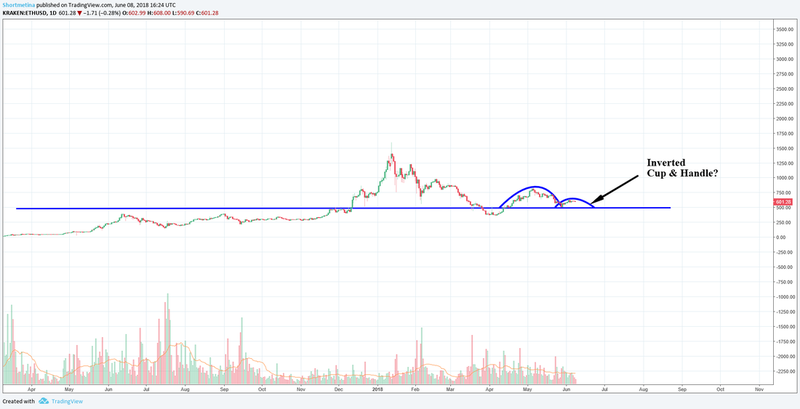 Similar to the other coins; I am expecting neutral price action for the month of July. Ripple continues to hover around the support level. As indicated in the last Newsletter, if support can continue to hold; I see an easy double from here. Decide what I can actually afford to invest in the space without becoming homeless (this protects me if the Crypto market turns out to be nothing but hog wash). As a general rule of thumb; I wouldn't invest more than 10% of my savings. For example; if I had $250k saved in the bank; $25,000 would be the MAX commitment. That way if the market goes south and all my coins become worthless; I still have $225,000 to roll with. Continue deploying money into the crypto currency space in phases. Phase 1 started around November/2017. Deployment of capital will take place as coins near their support areas (hoping to complete my total purchases in 4 phases). If this is anything like the stock market (which I've participated in for almost 2 decades); the more negative the press, the more likely these coins have a chance of succeeding. Remind myself to stay away from calling 'tops' or 'bottoms'. Add to position in phases; take some off the top as I see fit (this depends on your profit targets). Remind myself, this is a new space and the kinks will continue to get worked out. Feedback is so crucial to our community, let us know what you want to hear in the next Newsletter!